Rollin' News - World Wide Roller Derby News | Veteran City Rollers Win Their Home Bout! The Veteran City Rollers put on quite a show at their first home bout of the season Saturday evening. From the start of the first jam they dominated the Central Kansas Roller Girls. By the end of the night they had won the bout 218-75. The night started off with derby 101. This is when the crowd learns all the rules and regulations of roller derby. Derby girls may be tough but there are still important rules they have to follow. Your favorite derby girl can land in the penalty box for grabbing, holding, pulling or tripping other skaters. Fighting, punching, “clothes-lining” and intentionally falling in front of opposing skaters are also against the rules. The standard time in the box is one minute. If a derby girl gets sassy with the refs additional time may be added. Sofie Nominal, team captain, spent a little time in the penalty box Saturday night. When the refs sent her to the box fans booed loudly. 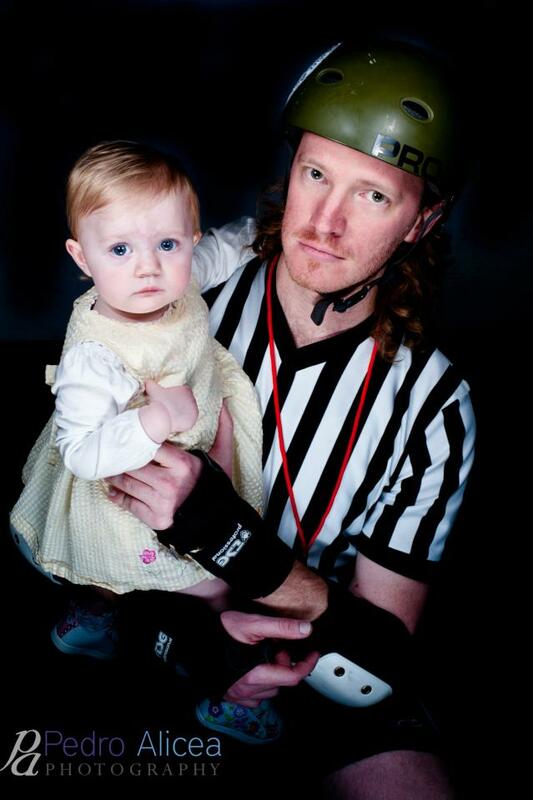 Referees for the bout included Tiny Truck, Two Wheeler, Jesse James, Side Effect, and Tom Bruise. Even the refs took some hard hits throughout the bout. Landing in the penalty box provides great entertainment but it doesn’t help a team score points. The only way points are scored is when the team jammer passes opposing blockers. The first time jammers pass through the pack no points are scored. However, for each additional opposing blocker they pass they score one point. There are four blockers from each team on the floor at a time. Together the eight of them make a pack. Blockers are busy playing offense by assisting their jammer and at the same time they play defense and attempt to block the opposing jammer. To ensure the pack works together the pivot sets the pace of the pack. She keeps her eye on the opposing team’s jammer and calls out plays to her team accordingly. Saturday nights top jammers were Doomcicle and Coco Loco. Coco Loco may be tiny but she is fierce. She snuck through the pack several times Saturday night taking on girls twice her size. Saturday’s bout was Coco Loco’s last bout with the Veteran City Rollers. She is hanging up her derby skates and moving to Oklahoma City. Fans and teammates alike will miss Coco Loco. Throughout the bout the crowd could be heard cheering “Coco” over and over. Travis Graham, fan, was sad to hear that Coco would be leaving the team. The Veteran City Rollers take on the No Coast Derby Girls at home 7 pm, July 26. Tickets are already on sale for the next bout. Advance tickets can be purchased at Rollers. The community giveback for Saturday nights bout was the Emporia Animal Shelter. A portion of the ticket proceeds will be donated to the shelter. The Veteran City Rollers are still accepting new skaters, refs and non-skating officials. If you are interested in roller derby there is a place on the team for you. If interested contact Veteran City Rollers at VeteranCityRollers@gmail.com, visit their website at www.veterancityrollers.com, or find them on facebook.